Riding fast doesn’t come with having a powerful machine and enthusiasm. It helps but, doesn’t guarantee it. Being quick is a skill and like most talents, if you’re not born with it, you’re going to need instruction to use it properly. Last month I spent a weekend in Spain with the Motocraft team at Monteblanco race track. It’s a circuit used for F1 testing so, it’s definitely qualified itself as a dynamic enough location for bikes too. Don’t be confused though, this isn’t a trackday away from home, it’s a 3 day learning experience with tuition. You will be allocated an instructor for the weekend who will orientate you to the circuit first (braking points, turn in points, apexes etc) and then using the onboard footage, will debrief you after every session. 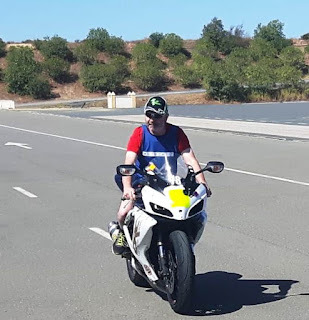 The tuition is aimed at track riding but, many of the techniques also apply to road riding and will make you a more confident and competent road user. Power is nothing without control. Spending money to get 20hp more than the next guy isn’t worth the expense if you’re bike is still wallowing 10m after the apex when everyone else is back on the gas. If you’ve never had your suspension setup, you’re doing yourself and your bike a disservice. The level of adjustment on today’s bikes is enough to transform your basic setup to a completely different machine. It’s also an important service for identifying faults on your bike. For example, 10 year old fork oil is past its useable date and the spring\preload on your rear shock absorber wasn’t designed for your size and weight. Kieran Ryan is on tap all weekend to assist with your bike. Set in the idyllic surroundings of Andalucía, the Monteblanco facility is less than an hour from Seville where we were based. Each garage is organised brilliantly with plenty of power points for tyre warmers, adequate space for working on your bike, a comfortable restaurant and excellent security at night. The hugely grippy track itself has everything from high speed straights, tight hairpins, elevation changing turns and plenty of run off when your ambition overcomes your ability. The surface is ideal for road and track tyres and the level of adhesion is unbeatable. Tracktime is as good as it gets with pit lane opening at 9am and carrying on until almost 6pm every evening, so your fitness will be tested. The package includes shipping your bike from Dublin on purpose built crates on which you can also transport your helmet, leathers and gear so all you need on the plane is weekend clothing. Your bike will be delivered directly to the track and repackaged for return to Dublin for collection. Accommodation is also included in the price and all of the services such as suspension advice, tuition and video footage are also included.